Kendall, the Oklahoma transfer who was momentarily, cowardly blocked from transferring to West Virginia by coward/weasel Oklahoma coach “Little” Lincoln Riley, is in a supposed “battle” for the starting position. Also competing for the starting position will be Jack Allison, who started and struggled in last year’s Camping World Bowl game loss against Syracuse, and Trey Lowe III, who played sparingly in the bowl game, but Kendall was the presumed starter ever since he signed with WVU in January. However, Coach Neal Brown has been insistent that all three will be given an equal chance to earn the starting job. Jack Allison, a Junior transfer from Miami, has ideal size for a quarterback at 6’6 and 200 pounds. As Will Grier’s backup, he was 6-10 for 86 yards last year. He could potentially challenge Kendall because he’s been here for a few years and has experience in last year’s offense, which is similar to Neal Brown’s offense. In addition, Allison has been accurate and impressive in the first two practices without pads. Trey Lowe III, a Redshirt Freshman and two-sport athlete who also plays outfield on the WVU baseball team, is the most mobile and athletic quarterback on the WVU roster. Neal Brown’s offense will rely on the quarterback using designed running plays to gain yards. He will also expect his quarterback to be able to extend plays with mobility and Lowe fits this profile better than Allison or Kendall. With the endorsement of Austin Kendall by Mountaineer Sports, the unquestioned leader in West Virginia sports news, Coach Brown will assuredly take notice. While at Oklahoma, Kendall was Baker Mayfield’s backup as a true Freshman in 2016, completing 16 of 22 passes with 143 yards, 2 touchdown and no interceptions. After redshirting in 2017, he was the backup for Kyler Murray, another Oklahoma Heisman trophy winning quarterback. He completed 12 of 17 passes for 122 yards, 1 touchdown and 0 interceptions. After waiting patiently for 3 years, Kendall assumed the starting job at Oklahoma was his this year. However, Lincoln Riley pulled another cowardly move by pursuing Alabama’s Senior quarterback, Jalen Hurts. Even if Kendall outplayed Hurts during the offseason, it was unlikely that he would beat him out for the starting job. Jalen Hurts is a very accomplished college quarterback and had a 24-2 record as the starter while at Alabama. He would not have transferred to Oklahoma unless he was promised the starting job for his Senior year. Kendall decided to look for another home as a graduate transfer. Neal Brown had recruited Kendall when he was an offensive coordinator at Kentucky and they maintained a relationship. WVU was the natural choice once Oklahoma finally relented and allowed the transfer to take place. What WVU gets in Kendall is an experienced, high IQ, consistent quarterback with a big arm. 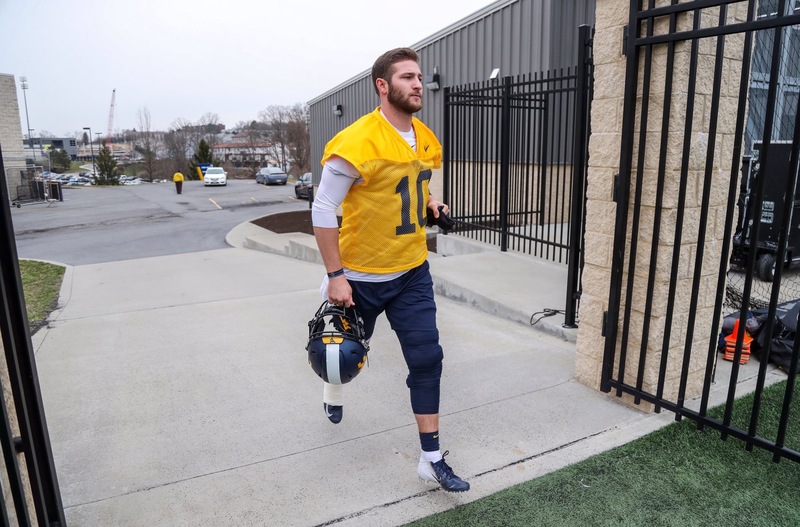 Having played behind two Heisman Trophy winners, he has learned a lot and will be mentally and physically prepared to lead the Mountaineers to a big year in 2019-2020.